Another gorgeous day on tour, we are spoiled. We have not had a raindrop the entire tour, which may be a first. Some friendly matches today and of course more training but we are licking our wounds and getting ready for games to start on Tuesday. Boys A and Boys B played against an old friend of mine from Chicago as both teams won 2-1 and played very well. 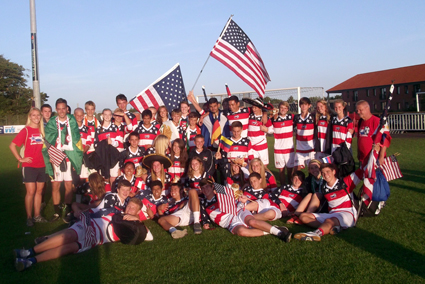 Really impressed at our level and excited about the Dana Cup. Girls trained in the afternoon and they are pumped to start play again as well. 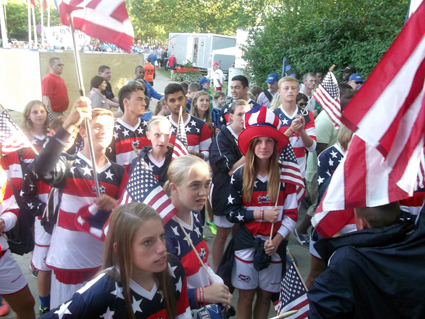 After dinner, Dana Cup opening ceremonies, which is a walk through town and our kids sang and chanted for over 3 miles, all dressed in our uniforms, waiving USA flags, etc. Early curfew tonight, 10 pm, as games start at 7:30, wish us luck. We don't have the same up to date scores as Gothia Cup last week, so be patient with the updates.